In his 1954 novel Lucky Starr and the Oceans of Venus, science fiction writer Isaac Asimov imagined seas filled with life and underwater cities on our neighboring planet. It wasn't long, however, before we discovered what really lurks beneath Venus's thick cloud cover. In the 1960s and 1970s, the United States' and Soviet Union's spacecraft found a dense, toxic atmosphere on Venus full of carbon dioxide and clouds of sulfuric acid. On the surface, temperatures were hot enough to melt lead, and the crushing pressure was akin to that found in Earth's deep oceans. All of this means that Venus is violently hostile to life. Even so, the planet is so similar to our own celestial body in size, makeup, and location that it's often referred to as Earth's twin. And in its distant past, it may have been even more Earthlike—scientists now believe that Venus could have once held oceans and a gentler climate. "People don't really fully appreciate how similar these two planets are," says Suzanne Smrekar, a geophysicist at NASA's Jet Propulsion Laboratory. "We hear so much about Mars, and yeah, currently its surface temperature is like Earth's. But probably for most of its evolution Venus was much more like the Earth." Despite this similarity, it's been nearly 30 years since the United States sent a mission to Venus. Smrekar and her fellow Venus researchers believe it's high time we returned. Venus, they argue, can shed light on Earth's history, what conditions a planet needs to become habitable, and whether the distant ones we are discovering beyond our solar system might have them. "The quest to understand life in the universe involves not just the Earth, but the Earth's twin," says Stephen Kane, a planetary astrophysicist at the University of California at Riverside. Earth went on to become a wet, mild world ripe for hosting life. "You really need to have a way to create climate stability for life to get started," says Michael Way, a physicist at NASA's Goddard Institute for Space Studies. On Earth, plate tectonics, which cycles carbon in and out of the atmosphere, make that stable climate possible. When volcanoes erupt, they shoot carbon dioxide out from the planet's interior. This greenhouse gas traps heat, keeping Earth toasty enough to support life. If carbon dioxide were allowed to build up, you'd get a hothouse like Venus. However, the Earth slowly recaptures carbon dioxide when it dissolves in rainwater, flows into the ocean, and is used to build carbonate rocks like limestone on the seafloor. As pieces of Earth's outer shell shift and grind together, they carry carbon back into the mantle. In other words, plate tectonics powers Earth's thermostat. Our planet's restless crust also recycles other nutrients, like phosphorus, that organisms need to survive. "The surface of the Earth is continually replenished by the plates moving underneath each other, Kane says. "Whereas Venus has essentially a single plate." While present-day Venus lacks plate tectonics, it may have behaved more like Earth in its early history. "Earth has been remarkably successful at keeping relatively clement climate conditions for at least the last 3.5 to 4 billion years," Way says. Because the two planets are similar in so many ways, this suggests that Venus might have had a stable climate and oceans at some point as well, he says. In fact, there is evidence of past water on Venus. Pioneer Venus, an American mission launched in 1978, measured a form of hydrogen called deuterium, also known as heavy hydrogen. On Earth, this isotope is much less common than regular hydrogen. But on Venus, deuterium isn't quite so rare in comparison to ordinary hydrogen, indicating that a great quantity of the lighter version of the element has vanished. "If you measure a big difference in these numbers it tells you that something has escaped from the planet, basically, and that something is water," Way says. Another clue came when Venus Express—an orbiter launched in 2005 by the European Space Agency—measured twice as much hydrogen as oxygen escaping from the planet's atmosphere. This suggests that the elements had once been joined as water. "Venus is absolutely fascinating because it's a world that should be very similar to Earth and yet evolved very, very differently," says NASA's Lori Glaze. It's not clear how much water Venus actually had on its surface; it could have been anywhere from a few yards deep across the entire surface to hundreds of yards or more, Way says. To figure out what ancient Venus might have been like, he and his colleagues used a series of computer models to simulate the planet's atmosphere. They reported that Venus could have had a shallow ocean and surface temperatures similar to those on present-day Earth for several billion years, up until around 715 million years ago. Venus rotates more slowly than the Earth, which could have helped make it more habitable. Because the Venusian day is so long, the sun heats parts of its terrain for months at a time. At that point, "Warm air rises rather forcefully and creates a planetary-scale cloud that blocks much of the incoming sunlight," Way says. "That can provide you a shield basically to help you be close to your parent star without overcooking in essence or boiling off your oceans." This cloud would unleash heavy rains, although they would be concentrated around the area directly facing the sun. At some point, though, Venus's fate diverged from that of Earth's, and the planet wound up as an "uninhabitable hellscape," Way and his colleagues wrote last month in a paper published to the arXiv. It's not clear why this happened, Way says. One possibility is that Venus's seas began to evaporate because the planet receives more solar energy than Earth. In the upper atmosphere, sunlight would have broken the water vapor into oxygen and hydrogen, which then fled into space. Without water to weaken the crust so it could break up, there could be no plate tectonics as we know it. 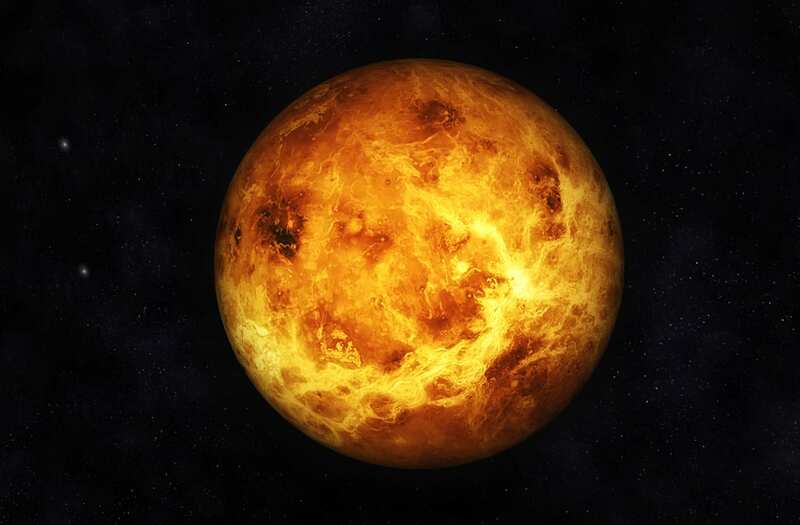 Venus would have become hotter and hotter as water vapor and carbon dioxide built up in its atmosphere. "It has undergone this runaway greenhouse and now it's stuck there," Kane says. "All the carbon is in its atmosphere, it has nowhere to store it because it has no liquid water oceans." The scorching, poisonous place Venus has become can actually give us a glimpse into our own planet's history. When the Magellan mission orbited Venus in the 1990s, it took radar images of the planet's surface that revealed mountains ranges. These features resemble mountains and plains of cooled lava created here on Earth when pieces of crust were jostled about by the sluggish churning of the mantle beneath them, scientists reported in December at the American Geophysical Union meeting in New Orleans. Similar forces might be active on Venus; it's possible that the planet's intense heat warms its crust enough that small pieces can slightly detach from the mantle about six to nine miles down. Some of the plains surrounding Venus's mountains had been deformed, suggesting that blocks of crust could have been moving about pretty recently. This isn't full-fledged plate tectonics—but it might be the first step in the process. We have little record of how plate tectonics kicked off billions of years ago on Earth, so the more recent activity on Venus might offer a few clues, Smrekar says. Our sister planet can help us understand present-day Earth as well, she says. Back in the 1970s, Venus proved key to our discovery that chlorofluorocarbons—chemicals used in hairspray, air conditioners, and other products—were a threat to the ozone layer. While creating computer models for the atmosphere of Venus, researchers at Harvard and MIT found that chlorine is really good at breaking apart oxygen compounds like ozone. Before long, another group at the University of California, Irvine, had realized that the extra chlorine we were pumping into our atmosphere might be doing the same thing on Earth. Venus also offers a preview of our future. Over time, stars increase in luminosity. This means that the planets in their orbit will be bathed in more solar energy. For a planet with liquid water and an Earth-like atmosphere, that means a one-way ticket to Venusville. "Once you break a planetary atmosphere...[it's] almost impossible to unbreak," Kane says. "Venus could be the eventual outcome of all atmospheric evolution." In fact, it "seems inevitable" that Earth will eventually follow Venus's path, he says. "The Earth has a delicate balance at the moment; it won't last forever." We're getting better and better at discovering planets beyond our own solar system—including ones about the size of Earth. We can't study the soil or atmospheres on these planets to find out if they might be amenable to life, though. "The planets that we're studying around other stars are planets that we will never be able to go to, at least not in the next several hundred years," Kane says. "Venus is very much a warning to us, because if we did not have Venus in our solar system...we may very well be far more cavalier in discovering Earth-sized planets around other stars and just assuming that they're habitable." Instead, we realize that two worlds that look the same from a distance can in fact be the Jekyll and Hyde of rocky planets. "As we discover new planets, the only basis we have for comparison are the planets in our own solar system," says Lori Glaze, a planetary volcanologist at NASA Goddard. "Being able to differentiate between an exo-Venus and an exo-Earth is going to be really important in how we go forward in our exploration." It's possible that Venus's proximity to the sun is the main reason why it turned out so differently from Earth. But there could be other, more subtle forces at work too, like Venus's lack of a strong magnetic field. "We'll need to take those into account because it could mean that we have evil Venuses hiding amongst the planets we find around other stars." On the other hand, if Venus's slow rotation rate once helped it sustain habitable conditions, it would make sense to measure how quickly exoplanets rotate as well. "There's this great cosmic accident that we have in our solar system: two planets that are so similar in size and adjacent in the solar system yet they are on opposite ends of the spectrum in terms of their habitability," Smrekar says. "If you really want to understand what makes a planet habitable, really the big question is, why are Venus and Earth so different?" Even though Venus is our closest neighbor, there's a lot we don't know about it. The planet's thick blanket of clouds makes it difficult to observe, although missions like Magellan and Venus Express have taken radar and infrared images of the surface. Those pictures revealed another challenge: The surface of Venus isn't very heavily cratered, indicating that it hasn't existed for long enough to get dinged up much. "Over the last billion years and perhaps over a much shorter time even, the surface of Venus has been completely reworked," Smrekar says. Perhaps because the planet lacks plate tectonics, heat periodically builds up underneath the crust until the surface is melted. Because of this, much of the evidence for what Venus's surface was like in its ancient past has disappeared. Then there's the fact that Venus's extreme conditions destroy any lander that visits within a matter of hours. "It's a very tough place to send missions; it's expensive and it's risky," Way says. "Mars is much easier to deal with." This means that funding is harder to secure for Venus than for the Red Planet. "Success begets success," Smrekar says. "If you find an exciting discovery on Mars you want to follow up on that, and it's been so long that we've had a mission to Venus that it's hard to get over that hurdle." Still, Glaze says, "There's getting to be quite a groundswell of support for Venus exploration." Akatsuki, an orbiter launched by JAXA, Japan's space agency, is currently gathering information about Venus's climate. And last year, NASA scientists proposed two missions that would have sent probes directly into the planet's atmosphere. The agency did not select either to advance in its New Frontiers program, but Smrekar, Glaze, and their colleagues are undeterred. Smrekar would have led the Venus Origins Explorer (VOX) mission to investigate how present-day Venus behaves. It would have used an orbiter to map the planet's surface and a probe to sample gases in its atmosphere. One of the questions Smrekar and her colleagues would have examined is whether Venus's craters have been buried in lava flows, which would be a sign of recent geologic activity. They'd have also looked for chemical signatures of active volcanism, such as a thin coating of new minerals formed when lava flows are exposed to the atmosphere. Another mission headed by Glaze—called Venus In situ Composition Investigations (VICI)—was awarded funding to hone its technology for future competitions. It would have sent two landers to visit highland plateaus that are older than the rest of Venus's surface. These features might be similar to Earth's continents, which are built from different kinds rock than its oceanic crust. VICI would have fired a laser into these rocks to vaporize a tiny bit of material, then measured the minerals present in both the plasma it had created and in un-vaporized rock. If Venus's plateaus have a different composition than the rest of the surface, it could mean that water was involved in forming them. During its sojourn, the spacecraft would also have measured gases like krypton and xenon. "Once they're put into the atmosphere when a planet is forming it's very hard to change them or remove them," Glaze says. "They kind of remain there like little atmospheric fossils to tell us about what went into the original makeup of Venus's atmosphere." She and her colleagues have built a full-scale prototype lander and tested its landing abilities here on Earth. The vessel is about 14 feet across and has a squat shape stabilizers that resemble spider legs to make it harder to tip over. Glaze and her team are unfazed by Venus's fearsome conditions. "We send things down to far deeper in the ocean [to] much, much greater pressures than we're talking about on the surface of Venus," she says. And most of the mission's key measurements could be taken in under two hours—so by the time Venus's scorching heat melts the lander's electronics, they will likely have done their duty. "Venus is hard to explore, sure, but it's not like it hasn't been done before 40 years ago," Smrekar says. We haven't sent a probe down into Venus's poisonous skies since last century's Venera, Vega, and Pioneer Venus missions. To know what to expect on the exoplanets are discovering far away, however, we'll need to take another trip next door. "It's incredibly important that we get back to Venus," Glaze says.